Here's my latest creation. I've procrastinated over it for the l-o-n-g-e-s-t time. 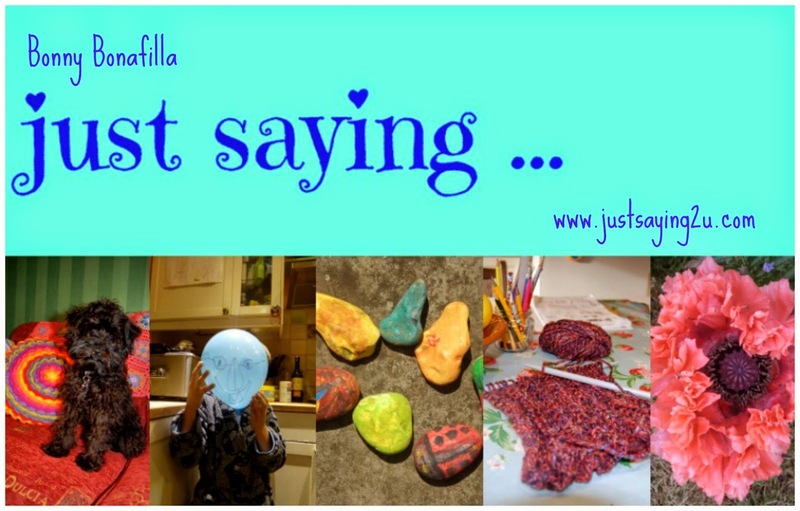 It's not difficult or involved or complicated or anything like that, but, with summer holidays and everything I've just not been able to focus on getting on with it. It's turned out pretty much as I'd hoped it would, and it's a great weight for these late summer nights or for the early days of autumn when the weather starts to cool down just a smidgeon. I always start with the back because it's the biggest piece, which has the least amount of shaping. That makes it the best place to master the lace pattern. When I'm knitting cardigans or jumpers and I've got to get the front and the back to meet in the right places for armholes and shoulder shaping I always keep count of the rows I've knit. That way, assuming that my tension doesn't undergo some seismic change during the course of the garment, I know exactly when I should be casting off to shape the armholes. It also helps to achieve symmetry in the pattern repeats as between the back and the front. 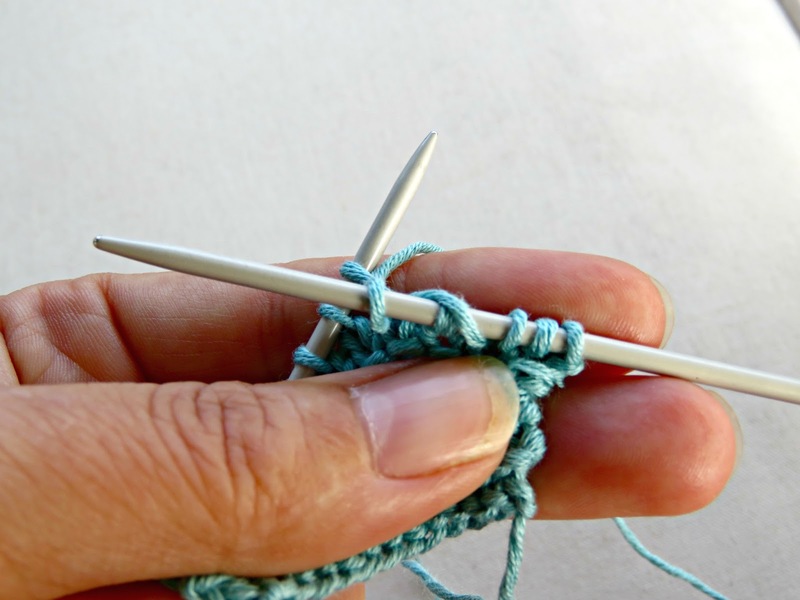 You could use one of those little row-counter gizmos that sit at the end of your needles. 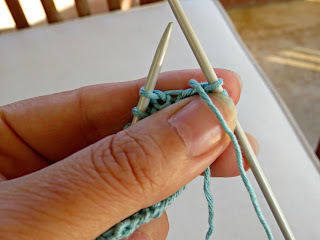 I don't like them because I use circular needles, which they don't work so conveniently with. Added to which I always seem to forget about them, whereas if I've got my notebook open beside me I will always remember to pick up my pencil write down my rows as I finish them. Let's make a start with the edging. 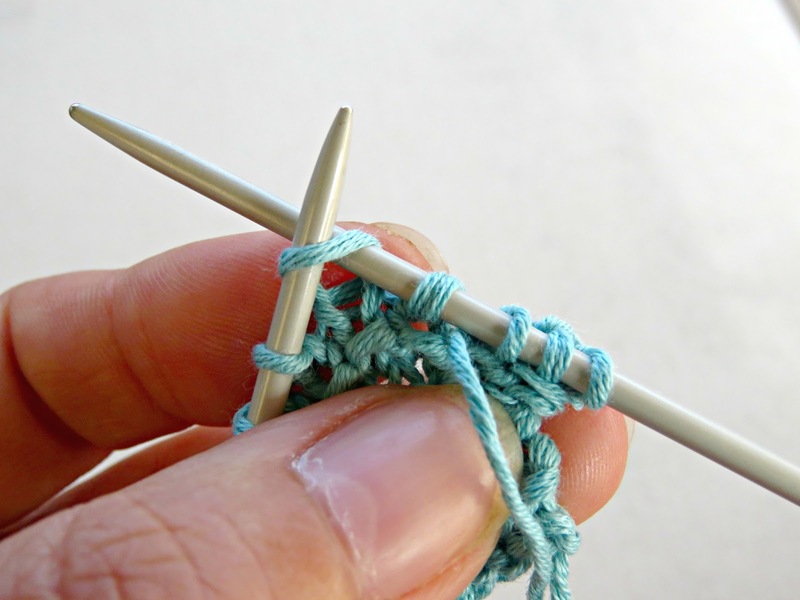 This repeats over 3 stitches, and then you need to add one extra stitch to get started. Cast on 112 stitches using 2.75mm / UK size 12/ US size 2 needles. Rows 1, 2 and 3 : Knit all stitches. Row 4 (Wrong Side i.e. you have the wrong side facing towards you as you work this row): K1, *Purl 2 together, wrap yarn around the needle, P1*, repeat from * to * to the end of the row. 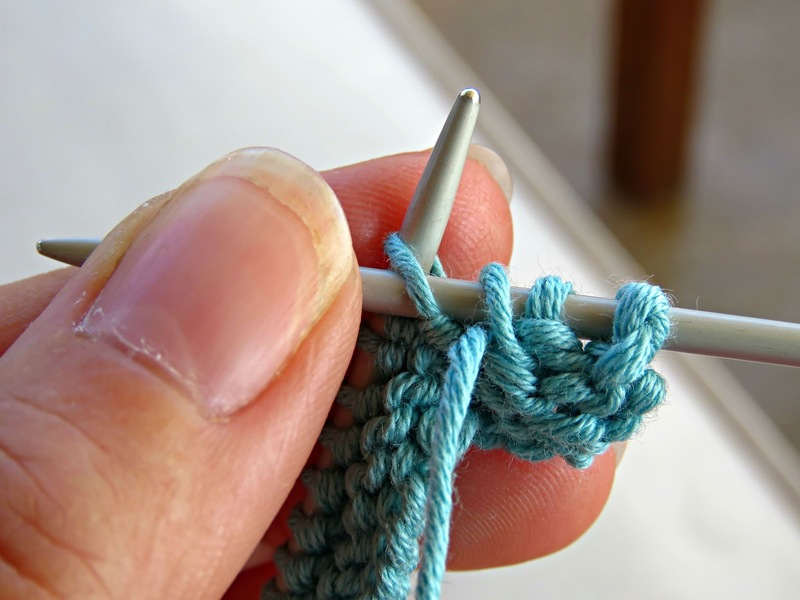 You should end this row with 112 stitches on your needle, and when you knit the next row you'll have pillars of two stitches with a space between them where you've purled 2 together during this row (row 4). Rows 5, 6, 7 and 8 : Knit all stitches. 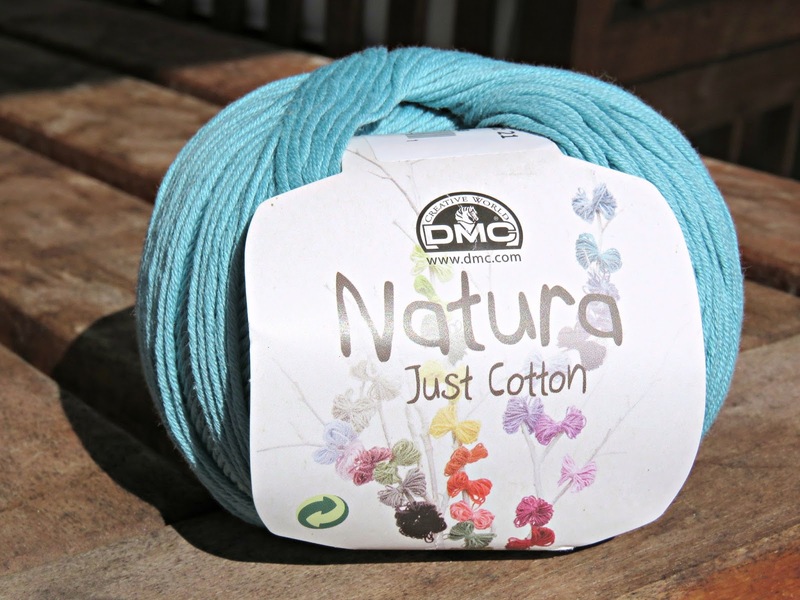 Change to 3.25 mm/ UK size 10/ US size 3 needles. Row 1(Right Side i.e. you have the right side facing towards you as you work this row) : Knit. Row 2 and all even numbered (wrong side) rows: Purl. Row 3: K3, *bring the yarn forward to the right side of the work (yfwd) (see photo 1 below), Slip 1 stitch knit-wise, K1, pass the slipped stitch over the knit stitch (psso) (see photos 2 and 3 below - the yfwd configuration when you knit creates a new stitch before your knit stitch, which replaces the stitch that you've passed over), Knit 6*. Repeat from * to * to last 5 stitches, yfwd, slip 1, Knit 1, psso, Knit 3. Row 5: K1, *K 2 together, yfwd, K1, yfwd, slip 1 knit-wise, K1, psso, K3*. Repeat from * to * until last 7 stitches, K 2 together, yfwd, k1, yfwd, slip 1, K1, psso, K2. Row 11: Knit 7, *yfwd, sl 1, K1, psso, K6*. Repeat from * to * to last stitch, Knit 1. Row 13: Knit 5, *Knit 2 together, yfwd, Knit 1, yfwd, slip 1, knit 1, psso, knit 3*. Repeat from * to * to last 3 stitches, Knit 3. Carry on repeating these 16 rows until the back (including the bottom edging) measures 33 cm / 13" in length - or if you'd prefer to make a longer cardigan carry on for whatever length you'd like it to measure to the bottom of the arm hole. 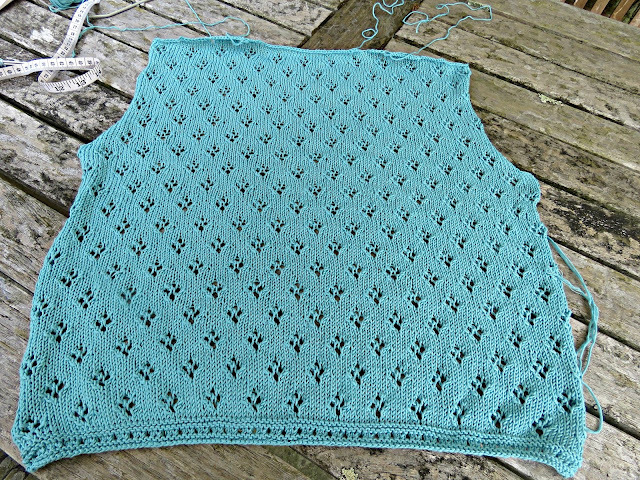 I was ready to start shaping the armholes on Row 97 of the lacy pattern section, but you'll need to check your tension and measure the length of the back to decide when you're happy to shape your armholes. Row 1 of armhole/Row 97 on my tension : Cast off 4 stitches at the beginning of the row, and work the remainder of the row in pattern. On my work it was easy as I was on row 1 of the pattern, which was simply a knit row. Row 2 of armhole/ Row 98 on my tension: Cast off another 4 stitches at the beginning of this row, and work the remainder of the row in pattern. In my case this was an easy row as it was all purl. By the end of these 2 rows you should have 104 stitches on your needles. You will have lost 8 stitches - 4 from either end. As the pattern works only on the knit rows you will have to calculate where you'll begin your pattern by doing a minus 5 to allow for the 4 stitches you've cast off over the first 5 stitches at the beginning of the patterned row side of the work, and carry on knitting in the pattern from there. On my work I was now on row 3 of the pattern which became: Knit 3, *yfwd, sl 1, k1, psso, k6* ... * because I'd cast off 4 stitches using the first 5 stitches of the row I started at the Knit 6 on the first pattern repeat i.e. I knit 6, *yfwd, sl 1 k1, psso, knit 6*, and carried on to the end of the row. You need to think about it a bit at first but you soon get the hang of it, especially when you can see the pattern knitting up and are able to follow it by eye. Rows 3 and 4 (99 and 100 on my work) work as normal with no stitch decreases. Rows 5, 6, 7, 8, 9, 10, 11 and 12 (Rows 101 -108 on my work) cast off 1 stitch at the beginning of each row, and continue to work the row in pattern. At the end of Row 12 of the armhole/ Row 108 on my tension you should have 96 stitches in total. Carry on in pattern, without any further decreases, until the depth of the armhole measures 20 cm, ending with a wrong side row. On my tension I started to shape the shoulder on row 153. Cast off 8 stitches at the beginning of the next 2 rows i.e. Rows 1 and 2 of the shoulder shaping. Row 3 (row 155 on my tension) Cast off 8 stitches, and continue working in pattern for the next 15 stitches. Turn. You will, at this point, have 16 stitches on your right needle. Row 4 (working only the 16 stitches on the right needle) Cast off 4 stitches and purl across the remaining stitches in pattern. You will now have only 12 stitches. Row 5: Cast off remaining 12 stitches. Row 1: With the right side facing, rejoin the yarn and cast off 32 stitches for the central neck yoke. Knit in pattern across the remaining stitches. You will have 24 stitches left on the needle. Row 3: Cast off 4 stitches and knit across the remaining stitches in pattern. Row 4: Cast off remaining 12 stitches. This completes the back section. 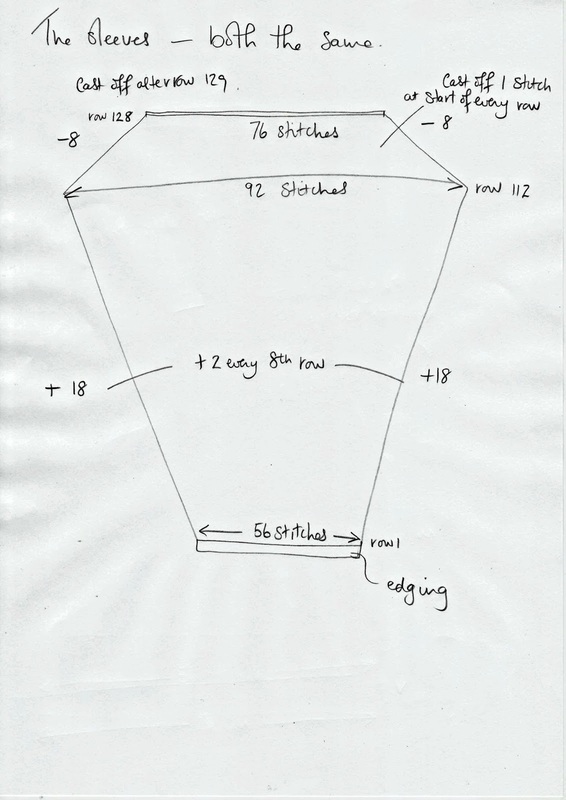 Here's a (not very high-tech) pencil drawing of what's involved in shaping the back, which will hopefully make things clear. Cast on 55 stitches using 2.75 mm/ UK size 12/ US size 2 needles. Work the first 7 rows for the edging as outlined for knitting the back. Row 8 of the edging: knit 27, knit into the front and back of the next stitch and then knit to the end of the row. 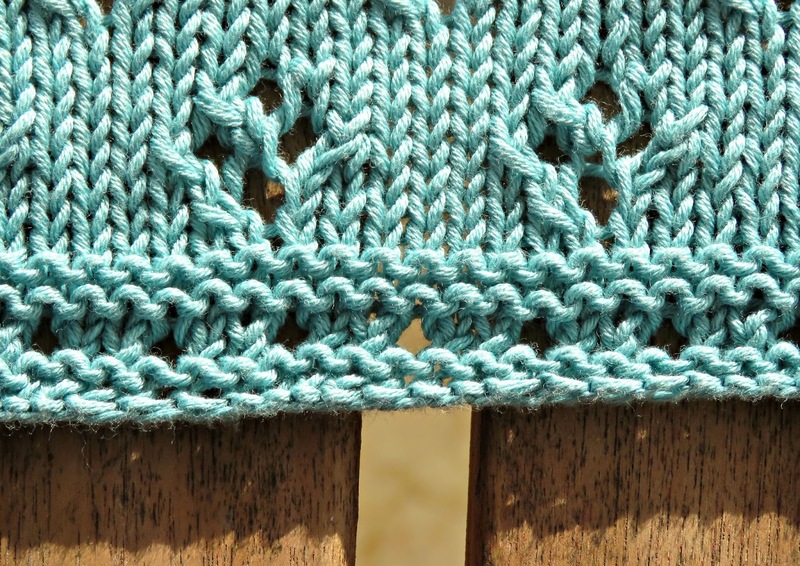 In this way you will end row 8 with 56 stitches, which gives you the correct number (a factor of 8) required for the repeats of the lace pattern in the main section. Change to 3.25 mm/ UK size 10/ US size 3 needles and work in the lace pattern as outlined for knitting the back until the work measures 24cm / 9 ½". Start to shape the V-neck on a wrong side row. On my left front I started to shape the work on row 68 (row 4 of the lacy pattern). Cast off 1 stitch at the beginning of this row and every fourth row for the next 76 rows . On my work this involved casting off 1 stitch on rows 68, 72, 76, 80, 84, 88, 92, 96, 100, 104, 108, 112, 116, 120, 124, 128, 132, 136, 140 and 144, resulting in a decrease of 20 stitches in total on the V-edge of the left front. These decreases, being on purl rows, do not affect your pattern calculations, which operate only on knit rows, and start from the other side. Once your work measures 33 cm you need to start shaping the armhole as well as carrying on with the V-shaping at the other side on purl rows. Cast off 4 stitches on the next right side row. On my work this was row 97 (row 1 of the lacy pattern). With the V-decreases at the opposite edge this left me with 44 stitches on the needle. Work 3 rows without any stitch decreases on the arm-hole side of the left front. On the next right side row (row 101 on my work) cast off 1 stitch at the beginning of the row, and repeat for the next 3 right side rows (finishing with the last cast-off on row 107). You will have cast off a total of 4 stitches on these right side rows to complete the shaping of the armhole, but you need to carry on with the cast-offs on the knit rows to continue shaping the V-neck. 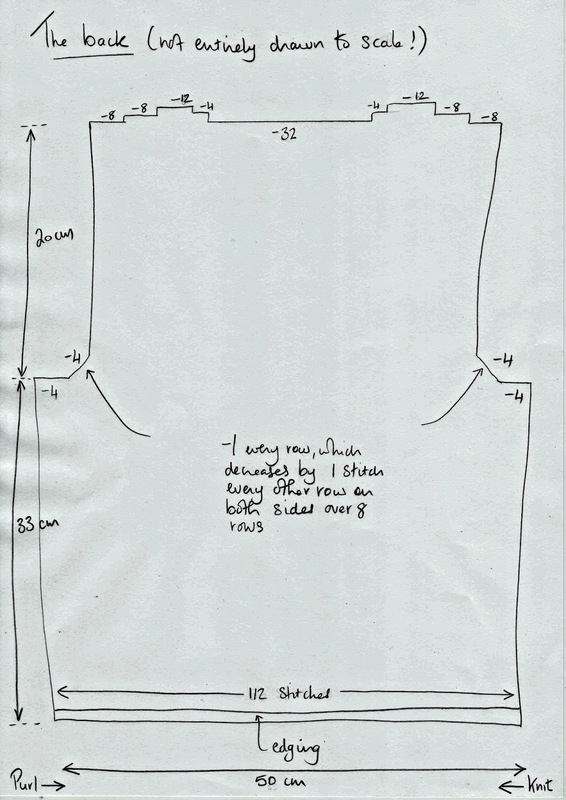 Continue until the armhole measures 20cm, and then start shaping the shoulder. On the next right side row (row 153 on my work) cast off 8 stitches at the beginning of the row, and work across the remainder of the row in pattern. Work the next wrong side row (row 154 on my work) as normal. On the next right side row (row 155 on my work) cast off 8 stitches at the beginning of the row, and work across the remainder of the row in pattern. Work the next wrong side row (row 156 on my work) as normal. On the next right side row (row 157 on my work) cast off the remaining 12 stitches. 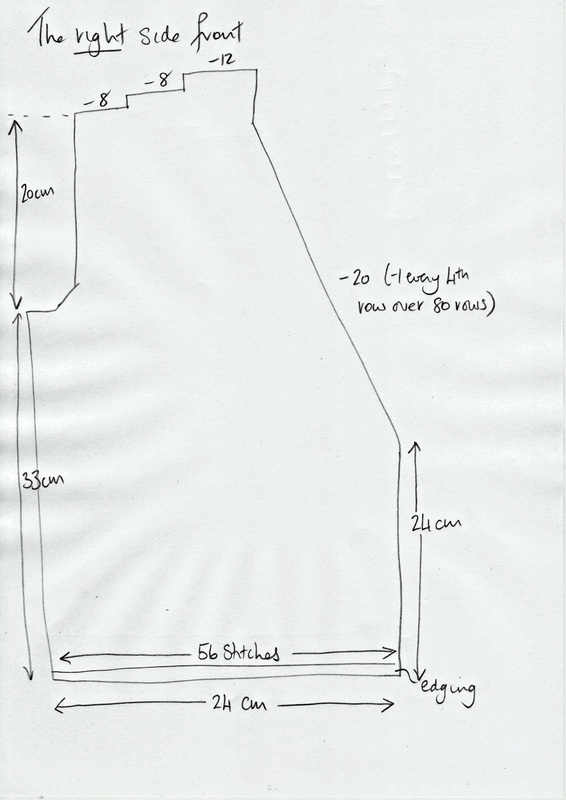 Here's another one of my homespun diagrams to show you what's involved. Start to shape the V-neck on a right side row. On my left front I started to shape the work on row 69 (row 5 of the lacy pattern). Cast off 1 stitch at the beginning of this row and every fourth row for the next 76 rows . On my work this involved casting off 1 stitch on rows 69, 73, 77, 81, 85, 89, 93, 97, 101, 105, 109, 113, 117, 121, 125, 129, 133, 137, 141 and 145 resulting in a decrease of 20 stitches in total on the V-edge of the left front. These decreases, being on the knit rows, do affect your pattern calculations, and for each row you have to discount one stitch on where you start on your pattern repeats. 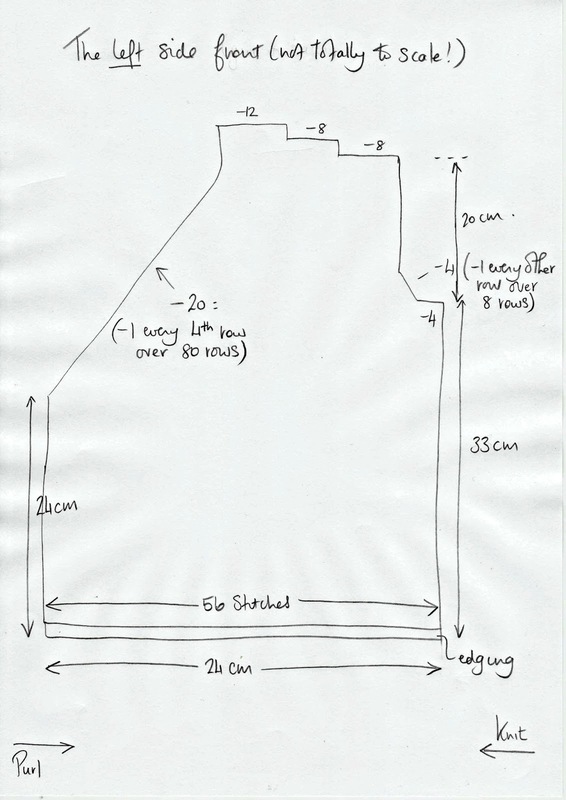 Once your work measures 33 cm you need to start shaping the armhole as well as carrying on with the V-shaping at the other side on purl rows. Cast off 4 stitches on the next wrong side row. On my work this was row 98 (row 2 of the lacy pattern). With the V-decreases at the opposite edge this left me with 44 stitches on the needle. On the next wrong side row (row 102 on my work) cast off 1 stitch at the beginning of the row, and repeat for the next 3 right side rows (finishing with the last cast-off on row 108). You will have cast off a total of 4 stitches on these right side rows to complete the shaping of the armhole, but you need to carry on with the cast-offs on the knit rows to continue shaping the V-neck. Continue until the depth of the armhole measures 20cm, and then start shaping the shoulder. On the next wrong side row (row 154 on my work) cast off 8 stitches at the beginning of the row, and work across the remainder of the row in pattern. Work the next right side row (row 155 on my work) as normal. On the next wrong side row (row 156 on my work) cast off 8 stitches at the beginning of the row, and work across the remainder of the row in pattern. Work the next right side row (row 157 on my work) cast off the remaining 12 stitches. 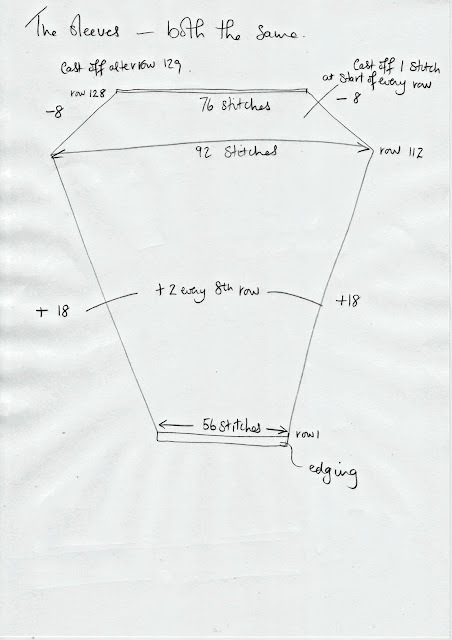 Change to 3.25 mm/ UK size 10/ US size 3 needles and work in the lace pattern as outlined for knitting the back. On rows 8 and 16 of each pattern repeat knit into the front and back of the first and last stitches, increasing the number of stitches on the needle by 2. 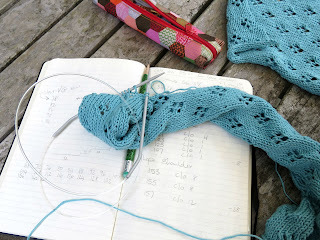 Carry on in this way, working in pattern - you need to add one stitch to your pattern calculations on each knit row after each increase row - until you have 92 stitches on the needles i.e. row 112. Rows 113 to 128, cast off one stitch at the beginning of every row, and continue to work in pattern. Row 129. Knit. You will now have 76 stitches on the needle. Row 130. Cast off all 76 stitches. 4: Block the sections of the cardigan and sew up. 5: Knit the button and button hole bands. These are knit separately, sewn to the left and right fronts and then joined using a kitchener seam in the middle of the neck yoke section. Let's start with the button band, which we will sew to the left front. Cast on 5 stitches using the 2.75 mm/ UK size 12/ US size 2 needles and work in moss stitch (knit 1, purl 1) on each row. Work until the band is of a sufficient length to go all the way up the side opening of the V-neck, and around the back to half way along the central neck yoke. Slip stitches onto a stitch holder and sew into position all the way around leaving a few centimetres un-sewn at the back, where this band will be joined to the button hole band with a kitchener seam. Sew the buttons in place on the button band, spacing them at regular distances from one another on the front section. Now we need to make a start on the button hole band. Cast on 5 stitches using the 2.75 mm needles and work in moss stitch (knit 1, purl 1) on each row. Place this over the button band, and when you reach the point at which you need to make a button hole: knit 1, knit 2 together, yfwd, knit 1. Then carry on with the next row in normal moss stitch. This will produce a button hole. I like to button the button hole band in place as I go so that I can get an accurate idea of where each button hole needs to be. Carry on until it's the desired length to meet up with the button band in the middle of the back yoke section, and then, without casting either band off, join them with a kitchener seam. Sew the final section of the button band and button hole bands in place and - phew - you're done!